배우 김소연이 시각장애인들을 위해 목소리 재능 기부한 사실이 알려졌다. 지난 17일 성북점자도서관 홈페이지 ‘소리 마을’과 성북 시각장애인복지관 홈페이지에는 “전문 배우를 통해 낭독된 음성도서 무료 배포”라는 글과 함께 녹음된 책 CD 배포 방법이 게재됐다. 홈페이지 안내 글에는 “특히 이번 무료 배포 사업은 지속적으로 낭독 봉사 활동을 해 온 배우 김소연 씨의 목소리 기부를 통해 제작된 음성도서(모리의마지막 수업, 달에게 들려주고 싶은 이야기)를 보급하게 되었습니다”라고 공지해 배우 김소연의 재능 기부 사실을 알렸다. 도서관 관계자는 “김소연씨가 적극적으로 임해줘서 깜짝 놀랐다. 한 권을 완성하는 것이 쉽지 않은 일임에도 불구, 꾸준히 와서 녹음하는 것은 물론 낭독할 책도 직접 선정해오고, 기관에 있는 시각장애인들과 함께 시간을 보내는 등 스스럼 없이 지내 놀랐다”고 전하며 “공지를 하자마자 오전부터 낭독한 책에 대한 문의가 이어지고 있다. 이번 기회를 통해 낭독 봉사가 알려지고 많은 시각장애인들에게 더 많은 책들이 보급됐으면 좋겠다”고 말했다. An actress Kim So Yeon donates the talent of her voice following the volunteer of recitation. It became known to everyone that an actress Kim So Yeon donated the talent of her voice for the blind. 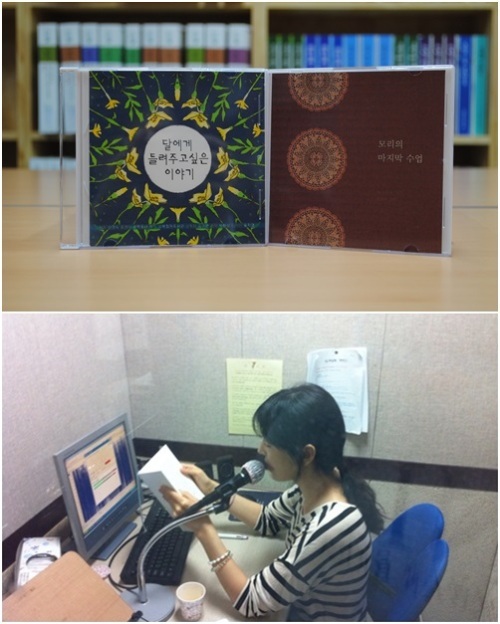 The way of the distribution of CD recorded a book ran on the Seongbuk braille library homepage ’Sound Village’ and Seongbuk Welfare center for the blind homepage with the notice ’Free distribution of a voice book recorded by an actress’ last June 17. A person concerned the library said "We’re surprised that she was engaged it actively. Although it’s not the easy work to complete one book, she came and recorded a book consistently. She also chose a book to read by herself and spent time with the blind in the center etc. As she was very open with them, we’re surprised. As soon as we noticed it, there have been being inquires about books from the morning. I hope that volunteering to read a book would be noticed widely and much more books would be distributed to the blind."